Yes, it's here - the new Gardenscape e-commerce website is now live. Just a few minor details to sort out but it's looking good so far. Many thanks to Rob and Lisa at Finally for all their work over the last couple of months, and for the support they will no doubt have to give us over the coming weeks while we work out how to cope with the new and very comprehensive admin system! Actually it's not that easy running a haulage business a day like this - the A21 is closed between Lamberhurst and Tonbridge, the M20 is at a standstill from the M25 to Ashford, the A249 is closed; our Westerham quarry is closed - and still the snow is coming here in Newenden. There is - unusually - hardly any traffic past the office right now (9am). 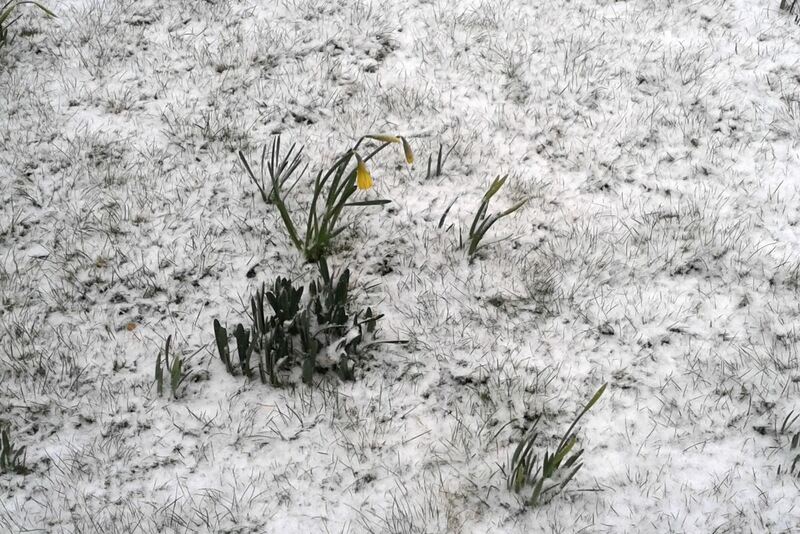 The forecast is for more of the white stuff this morning, and then quite a lot on Thursday. Might not be a terribly productive week! This is a recent addition to the Bourne Sport fleet of machinery - a Dakota 310 Turf Tender. 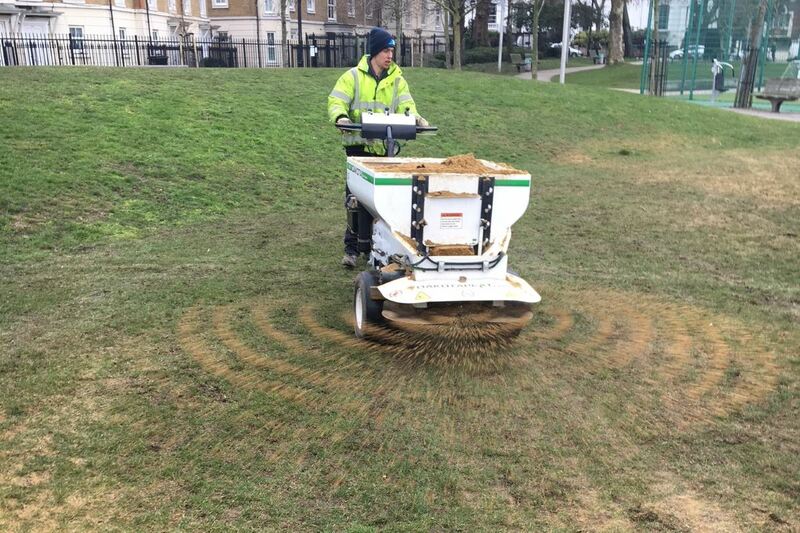 It is a compact machine for spreading various material - here you can see it used for top-dressing a park lawn in Camden. It can also be used, for example, for spreading rubber granules on artificial football pitches - an important part of keeping the synthetic grass in top shape. This is a relatively new development - earlier machines of this kind are much bigger and have to be tractor-towed. This, pedestrian-guided machine is ideal for getting into areas with narrow access gates. It has an 11 hp Honda engine and the spreading width can be adjusted up to 6 metres. There is a video of a Dakota 310 in motion here. We got there! 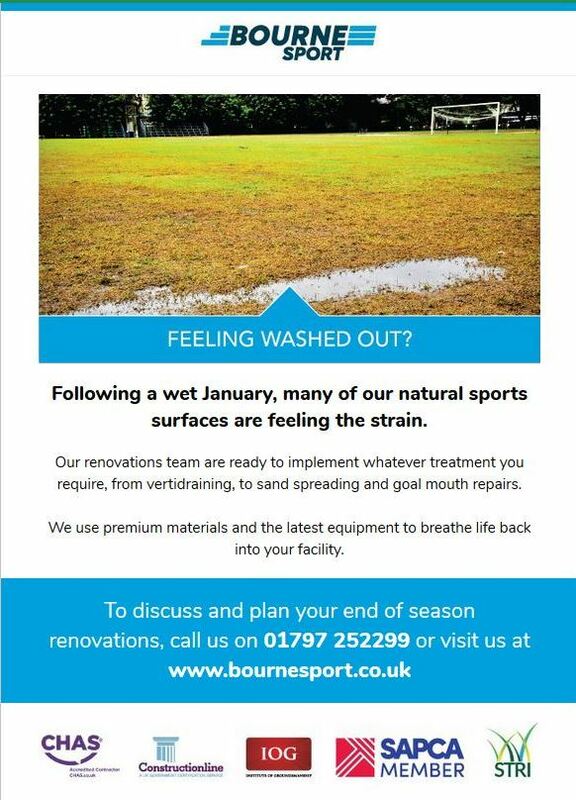 The new bourneamenity.co.uk website has been launched and is now fully operational. Still a few minor bits and pieces to add and adjust but it's all looking quite smart, we think. With the new Bourne Sport site well established and new sites for Gardenscape and John Bourne & Co coming online in the next couple of weeks, we'll soon have the full set of Group websites in commission. Many thanks to Alex and Liam at Lunar Works for their lovely design and clever coding!